Editor's Note: This article originally appeared in the San Diego BWA/Membership Highlights section of the Southern District BWA Website, and we appreciate the opportunity to share it here on the BTSD website. We believe the article first appeared in 2017 << fact check needed >> . Self-reliant and independent comes to mind when describing Ruth Voorhies. She is a 93 year old member of the Buddhist Temple of San Diego who throughout her life worked diligently to reach success in her education and in her career in the city of San Diego. Her life story is one of optimism even in times of difficulties and great challenges. Ruth's big smile shows her positive influence on everyone around her. Ruth is a native San Diegan born on February 26, to father Harry Goichiro Takahashi and mother Kotono Kondo Takahashi. Her father passed away when she was only four years old, leaving her mother to take care of her, her younger brother, Kikuo, and her aunt Florence and Uncle James, as well as her invalid grandfather Kanejiro Kondo. Ruth's mother supported this large family by operating the Kondo Pool Hall her grandfather supervised in the Gaslamp District. They sold ice cream, watermelon, shaved-ice ("kintoki"), candy and other food items to customers and families of those who came to play. The property also included a small business area for a "Five-stool Sushi/Meshi-ya" leased to an Issei couple. 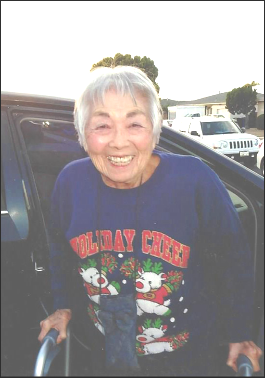 Ruth attended Lincoln Elementary School, Memorial Junior High and San Diego High School. During the depression her Japanese friends and she would walk to school together. Ruth said that her mother provided her with a good life where she never felt "in want." She graduated from high school in June 1941. After graduation, her mother sent her to the neighborhood sewing school where she graduated a year later. Shortly afterwards, as a result of President Roosevelt's Executive Order 9066, 2,000 San Diegans of Japanese ancestry were relocated from their homes to the stables of Santa Anita. Ruth's family soon had to leave the comforts of their home, bringing only 1 suitcase, to live for four months in the cold, damp and smelly horse stables of Santa Anita racetrack in Hollywood Park. In August, 1942, she and the others there were relocated to the concentration camps in the desolate and isolated deserts of Poston, Arizona where she lived during the war years. Her grandfather, who was in a San Diego hospital at this time, was transferred to Poston. He was bedridden with no professional medical help in camp. She and her family endured the difficulties of camp. For short periods of time, she was able to get away from the boredom and desolate conditions of camp life, by working in the tomato canneries in Utah. Then she and her family were released, they joined her aunt in Denver, Colorado. In Denver, and as a young adult, she found work through her sewing skills by working in a factory that made army tents for the war effort. How ironic that she did work that supported thewar effort of the country that incarcerated her and her family during that same war. In 1946, Ruth returned alone to San Diego where she worked and lived with the Kawasaki family at their original pre-war grocery store and taking refresher business courses while attending San Diego Jr. College whose classes were then located at the Spreckles Theatre Building. Her teacher encouraged her to take the Civil Service exam at the age of 63 for the junior clerk position for the City of San Diego. This temporary position was to become the first step in a progression up the ladder. She soon became involved with a new technology for the City of San Diego: computers. She was one of the original six to take the exam for the computer positions opening up in the city offices. At some point during this period, the government made public housing available to former internees, and the family was re-united in San Diego. Unfortunately, this reunion was without grandpa Kondo who had passed away in Denver in 1947. In the early 1950s and still single, Ruth purchased her first home with the help of her mother who made the down payment. The house is still standing and is located very close to the Temple. It probably cost no more than $12,000, but in those days, that was a lot of money and the down payment was a sizeable amount. Again her mother helped her to never feel “in want.” In 1956, Ruth married Clifton Lowell Voorhies and although the interracial marriage was not favorably accepted by her mother at first, mother and husband got along extremely well. In addition to having one mother-in-law living with the couple, it was not long before there were two when Cliff’s mother had an accident and could not live alone. They indeed had all the first-class babysitting help they needed for son Donald Clark. Don is now an executive with 20th Century Fox Television. While still working for the City of San Diego, installing computer systems for the city’s business systems, Ruth continued to take business and computer science classes at San Diego State and at National University from where she received her college degree. She worked for 33 years with the City and continued for 10 more years with the non-profit city affiliated San Diego Data Processing Corporation. Ruth retired from work in March 1988. During her 43 years of city service, she never once felt discrimination in any form at work. One week after her retirement in 1988, Ruth volunteered at Kiku Garden in Chula Vista and at the Japanese Friendship Garden in Balboa Park, where she continues to volunteer today. During a part of this period, Ruth also served as a Board member for Kiku Garden. Her post-war involvement at the Buddhist Temple of San Diego began when she and a few former Buddhist friends started the Kaiho or monthly newsletter for the temple which is still flourishing in the same format today. Ruth also served over 20 years as a Dharma School teacher and is especially proud to see many of her former students bringing their children and grandchildren to Dharma School today. She continues to be involved with the Temple being in charge of the Scrip program for many years, as well as a dedicated member of the Temple. Her involvement with the Temple dates back to attending Dharma School in the first Buddhist Temple of San Diego which was officially established in May, 1926 in a rented upper floor of the building located at 6th and Market Street in downtown San Diego. Reverend Tessho Kikushi was the first resident minister. Ruth has recuperated from an accident which fractured her left heel bone. She is happy to be back at the Temple without the assistance of a wheelchair or a walker. Her relative good health and positive disposition pulled her through this setback as it has throughout her entire life. She is an exmple of right mindfulness of spirit and action in overcoming adversity throughout her life. Her gratitude for her mother and extended family and her positive attitude and self-determination to succeed are qualities we can all aspire to attain. Ruth says okage sama de.